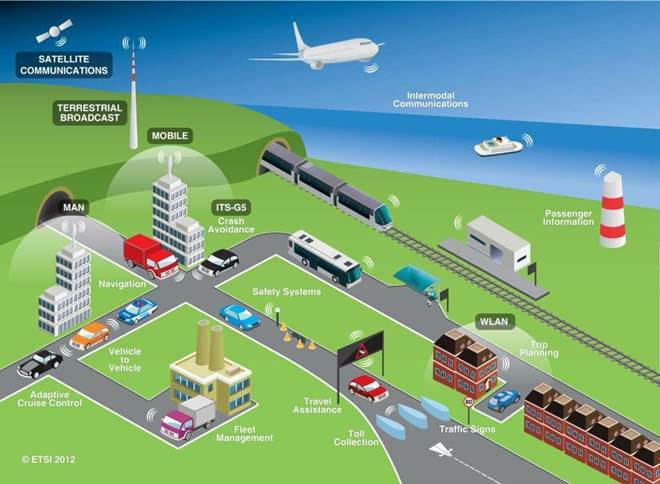 What Are Cooperative Intelligent Transport Systems (C-ITS)? Cooperative Intelligent Transport Systems (C-ITS) are vehicle related communication networks that are being rapidly developed on an international level. In relation to the public, the most often discussed applications of C-ITS relate to cars and other road traffic, but it also encompasses other forms of transportation, including water, rail and air. The different lines of communication that are considered part of C-ITS are any combination of the various bodies involved, that is, vehicles, infrastructure, and individuals using personal devices, potentially including pedestrians and cyclists. So, for example, C-ITS can be used to facilitate communication between vehicles, between vehicles and infrastructure, and between individuals and vehicles etc. In relation to road traffic, this communication can travel through a number of different systems: Dedicated Short-Range Communications (DSRC), which provide communication between vehicles and a particular location or structure, like a toll plaza; cellular networks; Wifi and Wireless Local Area Networks (WLAN); radio; and Global Navigation Satellite Systems (GNSS), like GPS. The use of C-ITS potentially presents a wide range of benefits, some contributing to improved road transport convenience, others to efficiency and safety. The most commonly provided examples of how C-ITS can improve road transport safety involve vehicle to vehicle communication of an impending collision. For example, drivers coming to an intersection, whose cars are not visible to each other, will be warned if their direction and speed is likely to result in an accident. An Australian report estimates that up to 35 percent of serious crashes could be prevented with the full integration of C-ITS. C-ITS will be able to communicate information gathered by vehicles and infrastructure regarding road and weather conditions, unexpected events like spillages or road closures, and other relevant information. In addition to improving safety levels, C-ITS also aims to increase road transport efficiency and reduce congestion by sharing of this type of information. The Australian Road Research Board (ARRB) is currently researching and planning for the introduction of C-ITS in Australia. Trials are being performed nationally in order to evaluate the precise nature of the benefits of C-ITS, to assist in the planning process and to help raise public awareness of the C-ITS and its potential benefits. The results of trials being performed elsewhere in the world will also contribute to the Australian research. Internationally, trials are well established and continuing across the US, Europe and Asia. In addition to its many benefits, the Australian National Transport Commission (NTC) has identified several key issues that the introduction of C-ITS will raise. These issues include legal questions regarding liability – who will be responsible for crashes that do occur while C-ITS are in use? – and driver distraction problems. Another complex problem that must be addressed with the introduction of C-ITS is the issue of privacy – who will be responsible for the vast amount of information gathered about individuals, companies and their vehicles, and how will this information be used? We are a specialist truck company operating around Perth & regional WA. Please call (08) 9410 1726 or use our contact form.